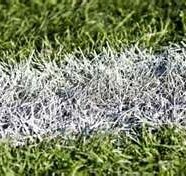 Sparkle #6 is a bright white, noncaustic dry line marking compound for athletic fields. It is completely safe for children and does not harm skin, uniforms, or turf. Sparkle #6 comes in pound multi-layer bags for ease of handling and application. It has been distributed throughout the Midwest since 1953 and is a registered trademark of Beacon Ballfields division Lodestar LLC. Sparkle #6 complies with the “safe use” requirements of the Consumer Safety Act Public Law 92-573. It also complies with the NCAA and NFSHSA rules for athletic marking materials.